Stamp a Sweet Impression: Our Friday Friend Beate AND TESC Celebrates 100! Our Friday Friend Beate AND TESC Celebrates 100! Happy Friday! It's a BIG day here at Stamp a Sweet Impression! Taylor is presenting her 100th Sketch for you to play along with over on her blog (head over there for all the info including PRIZES!) and Our Friday Friend is helping us celebrate with a sample for the TESC100 sketch. This week Our Friday Friend probably needs no introduction - certainly not to those of you who participate at Splitcoaststampers - Beate Johns is the Creative Director at SCS and brings us incredible tutorials week after week! In fact when we saw this amazing card created for this week's SCS tutorial we rushed to ask her to join us here at SASI today. We asked Beate a few questions so you can get to know her better. --What city/state so you live in? I currently live on Wright Patterson AFB in Ohio. --How did you get addicted to papercrafts? How long have you been stamping? After moving from a Nato bade in Germany to Scott AFB, Illinois, I couldn't find a quilting group on base. Everyone seemed to be talking about stamping. So I went to a Stampin' Up! workshop. I was hooked immediately. It was in January and I got FREE stamps for ordering. How cool is that? I have been stamping ever since. --How would you describe your style? What are your favorite projects to create? I love to sponge, distress, and sew and on my cards. It seems I can't create a card without several layers and lately, without using Nestabilities. My favorite projects are still cards. Coming from quilting, I love how fast a card somes together. --Do you have a favorite TE image? I can't narrow it down to one image. My favorite three sets are the new Animal Love Sentiments (with all those cute matching animal images), Discover Your Wings (featured here) and Christmas Blessings. --What is your favorite sweet treat? My favorite candy bar is Milky Way. My favorite cake is Donauwelle and my favorite cookie is Spritzgebaeck. 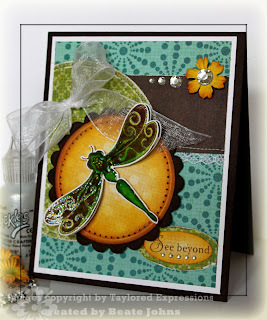 Beate's beautfiul card features Discover Your Wings. A portion of the proceeds from the sale of this set through the end of February are donated to the Now I Lay Me Down to Sleep Foundation. See more of Beate's work at her blog Fresh and Fun. Thank you Beate for being Our Friday Friend!!! We hope all of our readers will make some time to stamp this weekend and play in Taylor's 100th Sketch Challenge! Beate! This is fabulous! Love the great colors and the beautiful dragonfly! Love the turned sketch! Absolutely GORGEOUS Card Beate!!! Always been a big fan of yours and so glad you are the Friday Friend!!! Beate's card is gorgeous, and I loved learning more about her! Ooh, I'm so glad you're our Friday Friend! I love your card and also love those same techniques you do but your cards are prettier! Beautifully done Beate, in your signature style!! !